Type ‘Shearer interview’ into a search engine and you’ll get a strong sense of what makes The Simpsons and Spinal Tap luminary Harry Shearer tick. What you won’t get is much insight into Newcastle and England man Alan. And that’s just the way he’s always liked it. For a man who now makes his living in the media, Shearer has cultivated no strong and positive public image of his own. He spent his playing days avoiding the slip of the tongue or the comment made in haste that might have shone some light on his life, his work, himself. As a pundit, that identity vacuum remains firmly in place. The man is clearly intelligent – shrewd and savvy rather than academic – but his reluctance to open up and show the world at least a little bit of who he is means he will forever be viewed as a great player, of course, but otherwise…meh. Some players are remembered for brief moments of magic, others for years of excellence. The mavericks, the workaholics and the one-club men, all can earn a place in the hearts and minds of fans and followers alike. But with Alan Shearer, it’s all about the numbers. They tell you all you need to know. The Newcastle legend is the Premier League’s all-time top scorer with 283 goals in 559 top flight games. A goal every other game is impressive enough – only Thierry Henry can beat Shearer’s strike rate among the top ten – but when you realise that he is a massive 51 goals ahead of his closest challenger, Liverpool’s Ian Rush, and factor in a career spent playing almost exclusively for clubs who only occasionally found themselves in the top table mix, Shearer’s numbers are simply astounding. Numbers, though, are cold, emotionless things, which perhaps explains the lack of warmth most fans feel towards one of England’s greatest ever strikers. He’s never helped himself – probably because he doesn’t care – by going out of his way to market ‘Brand Shearer’. All of his public comments manage to imply an openness and honesty whilst simultaneously giving precious little away. Still, Newcastle supporters love him, as they should. He was the returning hero, the man who turned down Manchester United (and Barcelona and Juventus of his agent is to be believed) to spend his peak years at his home town club. At Newcastle, he won precisely nothing and in all, those 283 goals earned him just that single Premier League winners medal, with or without the creosote. For England, he was tournament top scorer at Euro ’96 and played well at the France ’98 World Cup. His final international haul of 30 goals could, and should, have been higher were it not for injuries, a 12-game scoring drought and his early retirement from national duties. So, a great player, no doubt, and a ‘classic English centre forward’, as the cliché will always have it. He was strong, physical and downright nasty at times, with a natural ability to score with his head, off both feet, inside the box and though the occasional long-range screamer. His outstanding domestic goal-scoring record looks set to stand for a long, long time. 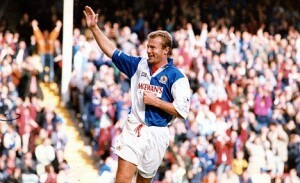 It’s the numbers that Shearer will be remembered for. And that, you suspect, is exactly how he wants it. We have a wide range of Alan Shearer-signed memorabilia in stock. And all UK orders come with FREE postage. This entry was posted in Football, Sport on September 25, 2015 by [email protected].